Dr. Claudio Ricci, a CAS-CONICYT Postdoctoral Fellow in astronomy, recently authored a review paper in 《Nature Astronomy》 with Cristina Ramos Almeida of IAC Tenerife, in which they summarized the most important developments of the past ten years in the fields of accreting black holes and circum-nuclear materials, as revealed by observations in the X-ray and infrared bands. All massive galaxies host supermassive black holes (SMBH) at their centers, and these objects are often found to be hidden behind large amounts of gas and dust. This circum-nuclear material is what eventually accretes onto the black hole, allowing it to grow, and its structure and evolution have been the subject of intense study in the past decade. Chinese Academy of Sciences South America Center for Astronomy (CASSACA)’s postdoctoral fellow Claudio Ricci and Dr. Cristina Ramos Almeida (IAC Tenerife) were recently invited to write a review for《Nature Astronomy》 on this subject, with the idea of combining results obtained from X-ray and infrared studies of the close environments of supermassive black holes. These two energy bands are highly complementary: while X-rays are produced very close to the supermassive black hole and allow the study of radiation absorbed and reflected, infrared radiation is directly produced by the dust around the black hole. A black hole is a place in space where gravity pulls so much that even light cannot get out, and therefore itself is “black” in any bands. The theory of general relativity predicts that a sufficiently large and compact mass can deform space time and give birth to a black hole. Black holes of stellar masses are expected to form when very massive stars collapse at the end of their life cycle. After a black hole is formed, it can continue to grow by absorbing mass from its surroundings. By absorbing other stars and merging with other black holes, supermassive black holes of millions of solar masses may form. The first widely-accepted black hole is Cygnus X-1 discovered in 1964, and it weighs about 15 solar masses (Figure 1). The well-known radio source named Sagittarius A*, sitting at the core of our own Milky Way galaxy, contains a supermassive black hole of about 4.3 million solar masses. Despite its invisible interior, the presence of a black hole can be inferred through its interactions with matter. Circum-nuclear materials falls onto a black hole, and forms an AGN (active galactic nucleus), one of the brightest objects in the universe, including an external accretion disk, an X-ray emitting corona, a broad-line region (BLR), a torus and a narrow-line region (NLR) (Figure 2), which have various physical characteristics, and their radiation are widely used to study the black hole and its surroundings. The review summarizes the most important developments of the past ten years in this field, and particularly in light of the most advanced X-ray and IR facilities. 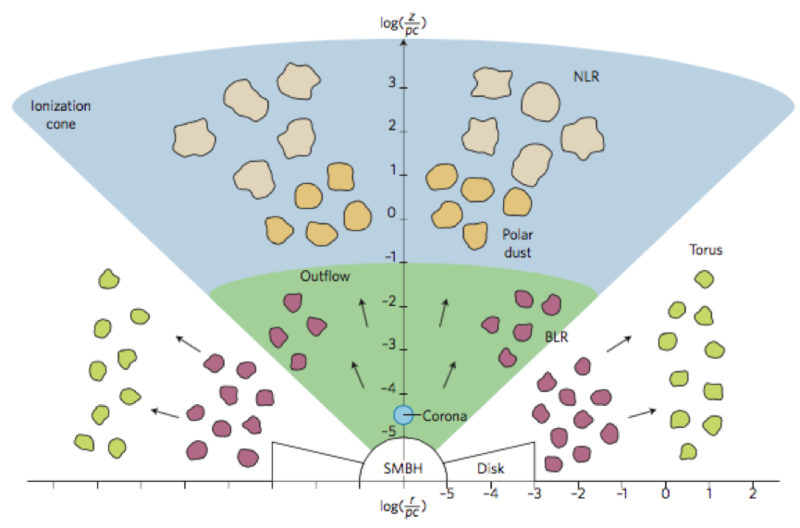 The authors discuss why the circum-nuclear material is anisotropic, clumpy, and connects with the host galaxy via gas inflow/outflows. They also highlight the importance of dust emission from the polar region of the AGN, possibly related to outflows caused by radiation pressure from the accreting supermassive black hole. Future observing facilities will allow a better understanding of the nuclear environment of AGN, and a fuller description on how it links the black hole to its host galaxy. In particular, the upcoming James Webb Space Telescope (JWST) will allow us to probe the structure and evolution of AGN’s polar dust, while high-resolution spectrometers, such as the ones on board XARM and Athena satellites, will shed light on the physical characteristics of the gas and dust. Dr. Ricci was invited to write this review because of his significant contribution to this field of research, and in particular in the light of his recent studies on the properties of the most heavily obscured accretion events in the Universe, and of the discovery that the merger of two or more galaxies can strongly affect the surroundings of the supermassive black hole, enriching it in gas and dust. Being able to publish review papers in such prestigious scholarly journals is usually an indication of wide acceptance and recognition of the author’s research work. For young scientists such as Ricci and Almeida, this is an even more remarkable testimonial to their creative contribution to the relevant subject matter. Figure 1. 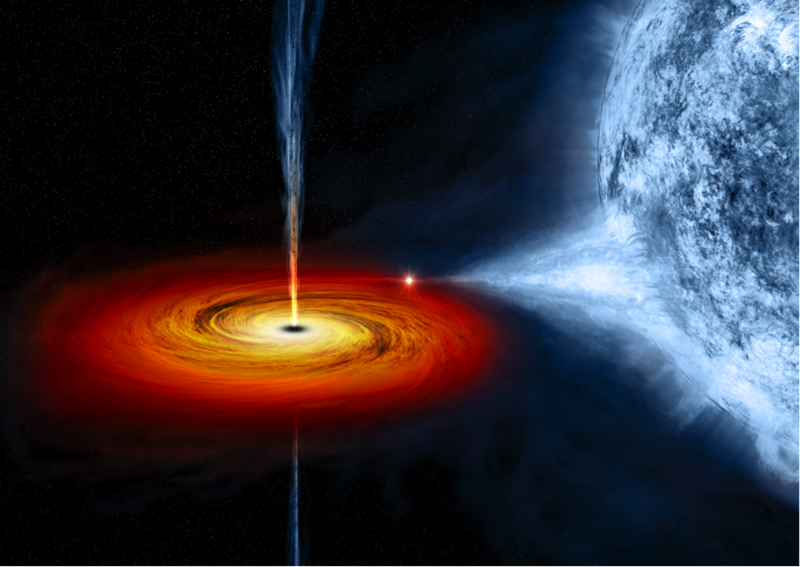 An artist’s drawing of a black hole named Cygnus X-1. It formed when a large star caved in. This black hole pulls matter from the blue star beside it. Taken from NASA/CXC/M. Weiss. Figure 2. Sketch of the main AGN structures, seen along the equatorial and polar directions. From the center to host-galaxy scales: SMBH (Super Massive Black Hole), accretion disk and X-ray emitting corona, BLR (Broad-Line Region), torus and NLR (Narrow-Line Region). Different colors indicate different compositions or densities. Taken from Ramos Almeida & Ricci (2017, Nature Astronomy). For more information about the Nature Astronomy Review, please visit https://www.nature.com/articles/s41550-017-0232-z.